Using eagle.io, The Department of Natural Resources, Mines & Energy is now able to effectively manage water harvesting entitlements in Oakey Creek catchment - Queensland, Australia. 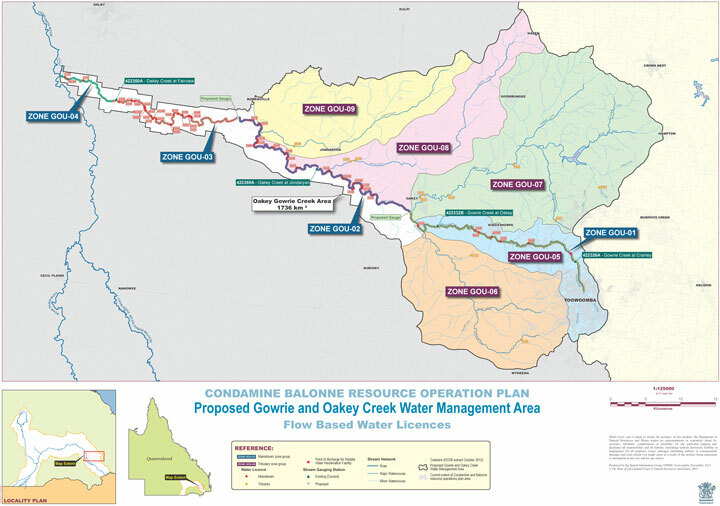 Prior to 2014, water harvesters in the Oakey Creek catchment extracted water under a licence. Under the licence conditions, extraction volume and timing was self-administered by water harvesters, by physically assessing flow depth at the take point from a physical gauge during rain events. Physical inspection of flows at take points during rain events was time intensive and inconvenient for water harvesters. In addition, manual inspection resulted in periods where users missed the opportunity to take water because they were unaware of flows, it was difficult for DNRM to assess compliance with conditions, and self-administration created the potential for conflict amongst water harvesters vying for this scare resource. To address these issues, DNRM began transitioning to a centrally administered program in August 2014. Under this program, DNRM constructed two new gauging stations to complement the three existing gauging stations on Oakey Creek and measured flows. Water harvesters are permitted to extract water when flows measured at the gauging station immediately upstream of their extraction point reach a nominated flow rate (extraction trigger). The extraction trigger is nominated in each individual entitlement, and is different for each water harvester. To administer the program, the department quickly identified that manual notifications would not be sustainable, and that notifications needed to be automated. Image 1 Proposed Gowrie and Oakey Creek Water Management Area. 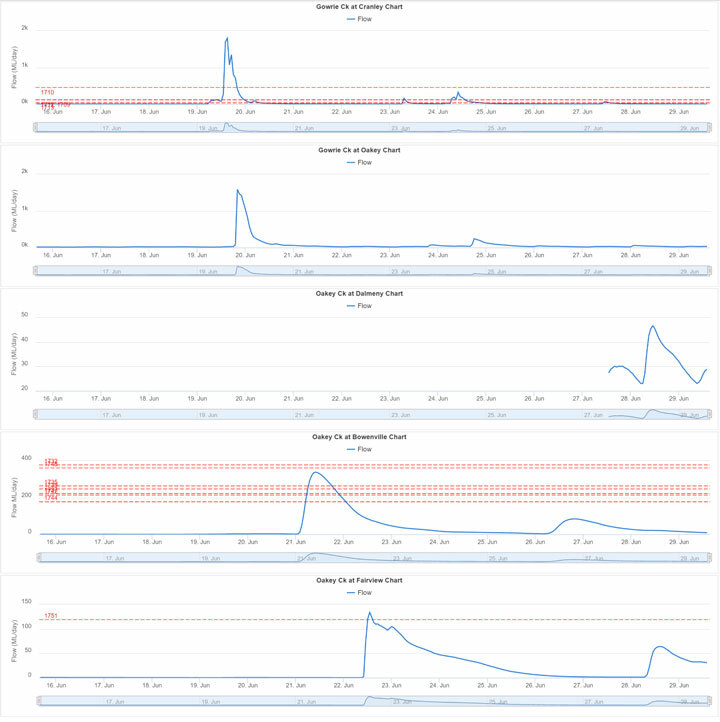 Flow data from the 5 DNRM gauging stations were pushed to eagle.io via FTP. In an afternoon workshop with eagle.io staff, DNRM staff built dashboards for each gauging station, and a summary dashboard for their own purpose. Extraction triggers were configured and associated with the 41 individual water harvesters. In so doing, each landholder would receive SMS or email notifications when their extraction triggers were reached during rain events. Although it was useful for DNRM officers to see all of the extraction triggers, it was thought that this may unnecessarily complicate dashboards viewed by landholders. DNRM wished to hide all extraction triggers that did not apply to the landholder viewing the dashboard. This feature was not available at the time, but as part of the professional services delivery, eagle.io made changes to the configuration of custom charts in the following week and the solution was delivered. Image 2 Screenshot of eagle.io Limits and Flow as seen by an DNRME user account. Eagle.io could be an end-point that landholders could email or text in reports of volumes and times of extraction, streamlining reporting and compliance for DNRM. 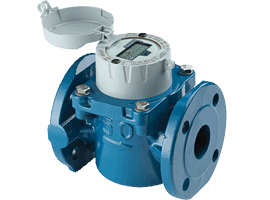 By attaching telemeter flow meters to pumps (such as one of the products offered by Elster – Image 3), flow data from each landholder could be automatically reported back to DNRM, ensuring 100% compliance with licence conditions. Using a supported 3G wireless gateway, we anticipate that it will be likely for landholders to remotely actuate pumps when flows permit it, saving a trip on the motorbike in the rain to turn the pump on. Following the next major eagle.io upgrade, the platform would allow supported pumps to be automatically triggered when flows reach each landholder’s individual extraction trigger. "The eagle.io team visited our office in Toowoomba and spent two hours training the team on the use of the system. By the end of the day, we were confident in building new dashboards, configuring alerts, and inviting users. The ability to share and automate notifications to landholders has significantly reduced our workload, and eliminated the risk of landholders missing out on notifications. We love the user friendly interface and look forward to being able to receive metered use through eagle.io."